After travelling all the way from Liverpool, the performance was uninspiring, lacked creativity, and was rather flaccid in all areas…however, this isn’t a review of Liverpool’s football team. The wonderful Royal Liverpool Philharmonic Orchestra also crossed the Pennines, but with entirely contrasting results. The pleasingly youthful audience (and not a replica shirt between them) enjoyed two contrasting, but complementing, pieces from one of the UK’s finest orchestras. The evening kicked off with the 11th, and latest, symphony from Philip Glass, which premiered in Carnegie Hall this year to mark the composer’s 80th birthday. All three movements were intriguing, with typical Glass dynamics and themes running throughout. Particular emphasis was paid to rhythm, and I felt that his 11th is possibly his most vibrant and modern symphony (not in the sense of screws on piano strings). The heavy, marauding bass (four contrabass, a tuba, bass trombone and three further trombones, plus the all-important timps) lent power to the softly undulating string sections in the first movement. The second movement was altogether a gentler affair, still with the trademark Glass arpeggios, but developing into a quick and energetic melody, reminiscent of a film score. The third movement featured a military-esque drum rhythm, which dictated the timbre of the piece, ending in a fairly extensive coda, but not annoyingly so, it was no Lord of the Rings. It was exciting to see a world-premiered composition on tour; Glass is surely one of the last surviving composers who could be legitimately taught on A Level music courses (he was on mine 20 years ago!). Glass was shattering, so after a break (sorry Ed., had to slip that in) we returned to the more familiar comfort of Rachmaninoff’s 2nd symphony. 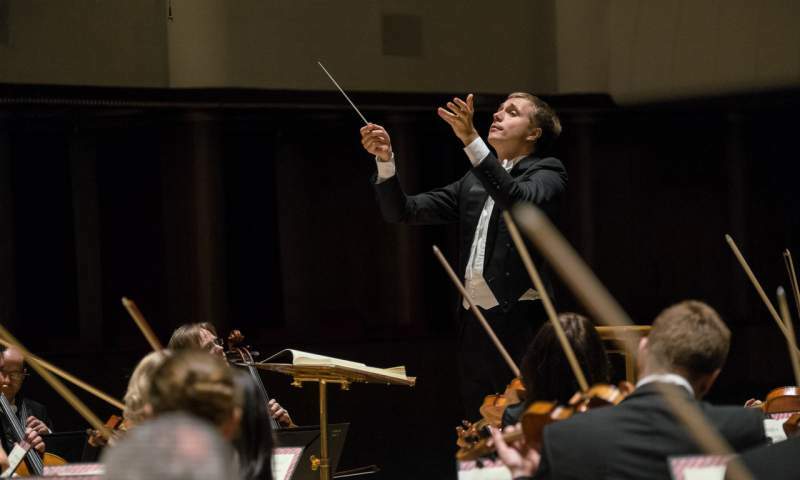 Vasily Petrenko looks very young (he’s 41), but his command of his orchestra is excellent, and he guided them beautifully through this most romantic of pieces. Long, at around an hour, but with enough interest to maintain concentration (despite the removal of the piano, which I like), Rachmaninoff’s 2nd was perfectly executed and perfectly suited to what had come before. I sometimes wish it was socially permissible to read a book or something during a concert, because I do tend to enjoy long symphonies as an accompaniment to another task, however, despite a large meal and a couple of pints beforehand, sleep was never on the agenda (more than I can say for the girl behind me). Classical season is underway at Sage Gateshead, and I’m looking forward to broadening my musical horizons further in the near future.